Last year was the third edition of the UK’s most ambitious public arts project, Folkestone Triennial 2014, and it could be argued that it was the biggest and best yet. The Triennial was curated for the first time by Lewis Biggs, under the title, Lookout, which was more fitting than Lewis or the Creative Foundation (CF) could have expected. As predicted, Alex Hartley and a number of volunteers took their position looking out over the harbour from their Grand Burstin-base camp as part of Vigil. Triennial-goers looked out over the town from the exhibition’s wind-powered lift and over the harbour from Gabriel Lester’s bamboo observation deck. Something & Son’s sustainable greenhouse looked to the future, experimenting with alternative urban food production. The more surprising events included the thousands of people that came down to Folkestone to dig up Michael Sailstorfer’s treasure buried on Folkestone Outer Harbour Beach. The appropriation of disused spaces such as Emma Hart’s installation in a domestic interior and Tim Etchells’ neon text work in Folkestone’s derelict harbour railway station offered a renewed perspective on a familiar townscape. The Creative Foundation team took this one step further by inviting muf architecture/art to completely renovate an area of the Creative Quarter known as Payers Park. Previously a sloping wasteland, it is now a permanent park specially designed for the different needs of people in the local area. In addition to Payers Park, around the third of the works from this year’s Triennial will become permanent fixtures in the town, adding to the permanent collection of Folkestone Artworks that have been created from the previous two Triennials. Folkestone has amassed one of the most unique and quirky art collections in the UK, making it quite a special place to live, work and study. With 135,000 visitors, more people than ever visited Folkestone for the Triennial this year, cementing it as a one of the South East’s leading cultural destinations. The Folkestone Triennial public programme was buzzing with activity for the duration of the festival. With two conferences, field trips, artist-led events, historical and community talks, guided tours, family and schools workshops on offer, there was something for everyone. The Triennial in 2014 was a development on the first two Triennials of 2008 and 2011. These excellent exhibitions made a point of bringing great art into Folkestone in the summer; the high point of any seaside town’s tourist season. The exhibitions managed to bring a great deal of attention to Folkestone that brought a significant number of visitors, a number of whom made a commitment to the town by renting property from the Creative Foundation. For 2014 a new strategy was adopted. The Triennial was moved to the autumn, opening at the end of August and closing in early November. This decision represents a significant change for the Triennial and a change of emphasis for its promotion and audiences. There were four key audiences for the Triennial; locals who live in the region, education including schools and higher education, arts specialists, and tourists to the region. The new strategy was supported by the research from Visit Kent that made it clear that Kent receives few international tourists and those that come are mostly interested in heritage. If people do visit the county it is predominantly for a day and those who stay overnight mostly do so by staying with friends and family. The Triennial plan adopted has therefore been to use the press particularly for the art world, to build an education plan that includes two conferences and a marketing plan that aims for local engagement through the local press and lastly a campaign for visitors already in the region. Much of this was done through locals by encouraging them to invite their friends and family to the Triennial. This plan excluded any campaign for the hard to reach people from outside Kent or the country who show little propensity to visit. The Triennial partners who include the artists and arts organisations of the Open and Fringe, the local businesses, including retailers and restaurateurs, along with hotels wished to see a plan that included those outside the region. While our partners appreciated the move to autumn to extend the Folkestone season, they felt that no other event in Folkestone, part from the Triennial, has content and a reputation that will bring attention to the town from outside the region. This only happens every three years and felt this opportunity should not be missed. The value of any greater plan would be of creative benefit to some partners and business benefit to others. 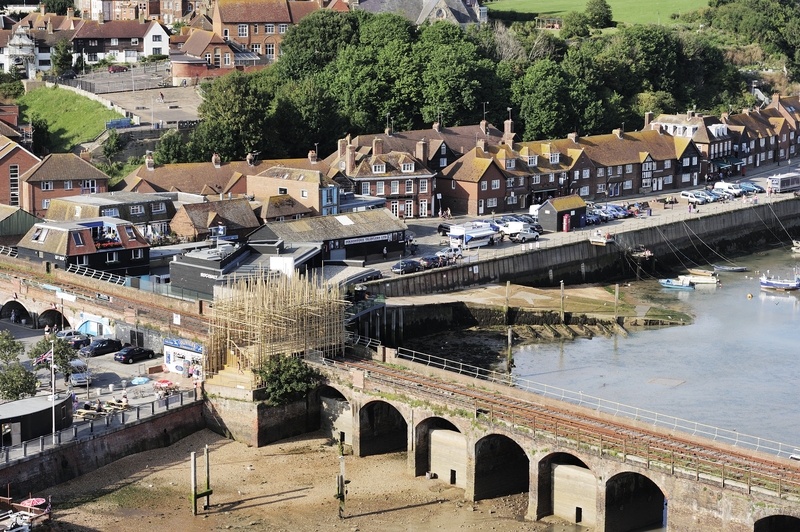 Work with new partners in order to attract new visitors to Folkestone and the Triennial. Engage with audiences from within and outside Kent and capture the essence of the new Folkestone. Increase the number of national and international visitors to the Folkestone Triennial. Increase the coverage of the Triennial in international websites. Achieve 30 blog sites mentioning the Triennial. Measure the number of audiences who also visit other cultural destinations in East Kent. 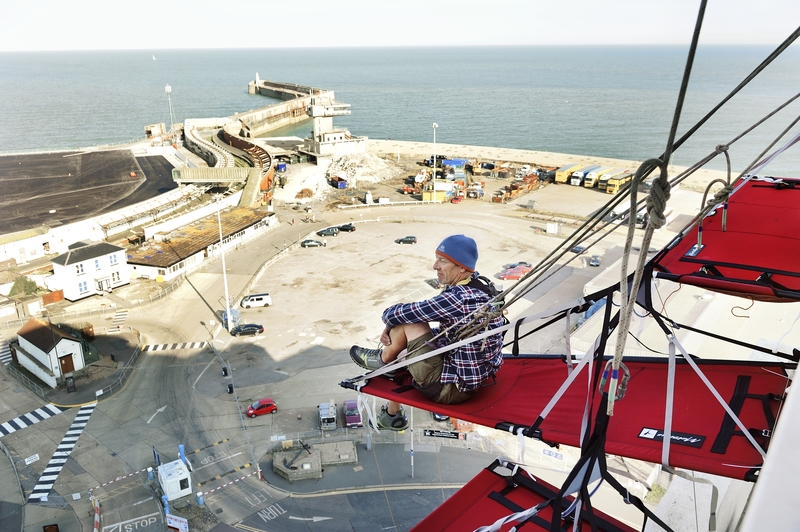 Experiential activities on board of the DFDS ferries over a weekend in September engaging with travellers to and from Britain. 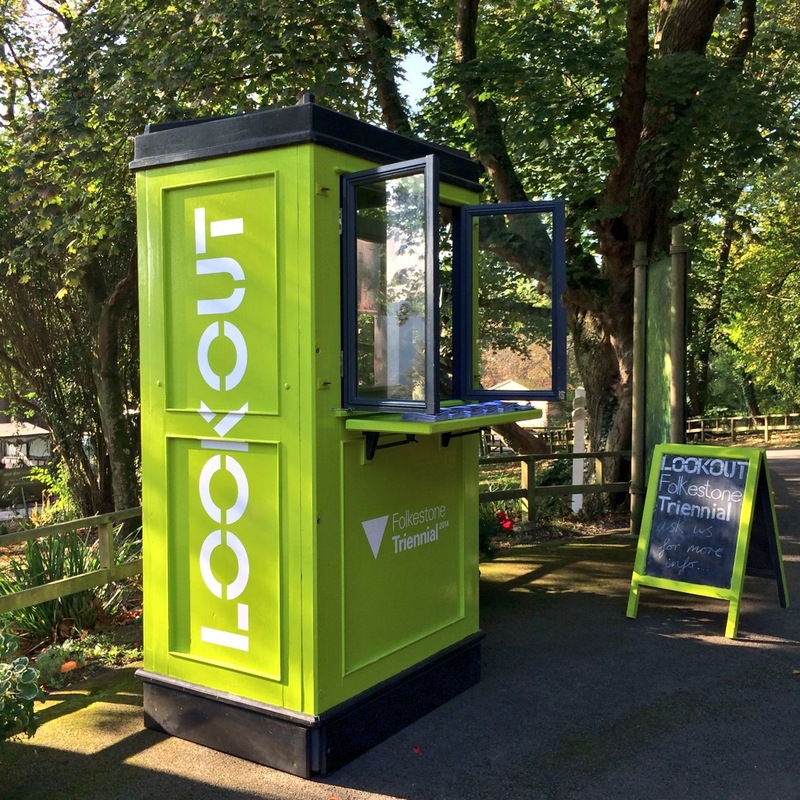 Moving the Triennial Kiosk during September and October to key tourist and visitor attractions in Kent, run activities and encourage people to visit & the Triennial, spend time and money & discover the town. 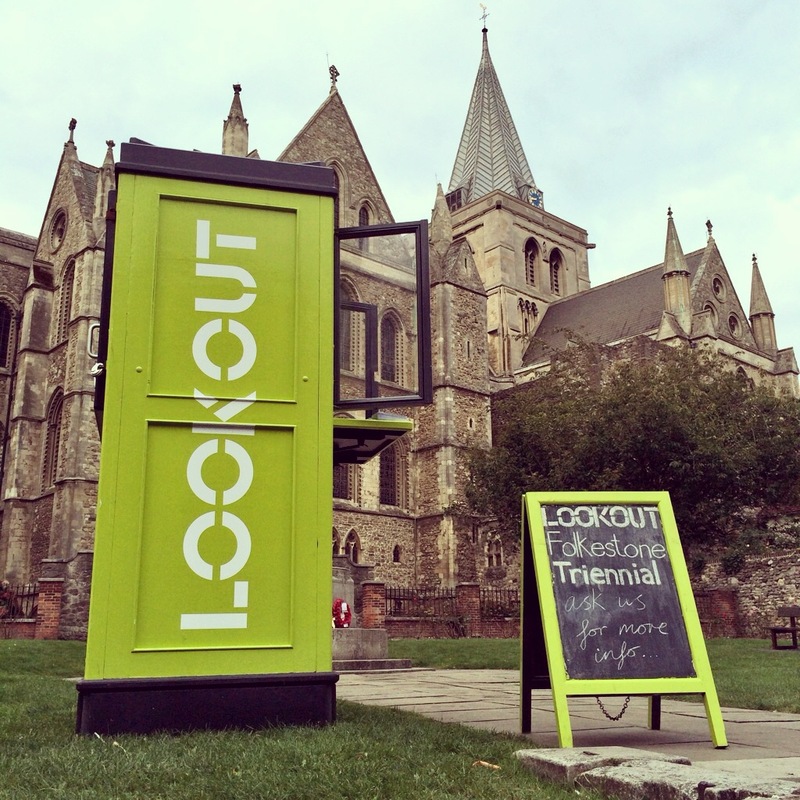 The kiosk visited Canterbury West, Turner Contemporary in Margate, Rochester Cathedral, Port Lympne Safari Park, Ashford Designer Retail Park and Chatham Historic Dockyards. Having a presence at the St. Pancras International Station over the opening weekend of the Triennial (30 & 31 August), as well as on the first weekend of October to promote the show, deliver an interactive activity and promote the town, local hotels, restaurants and the Creative Quarter. 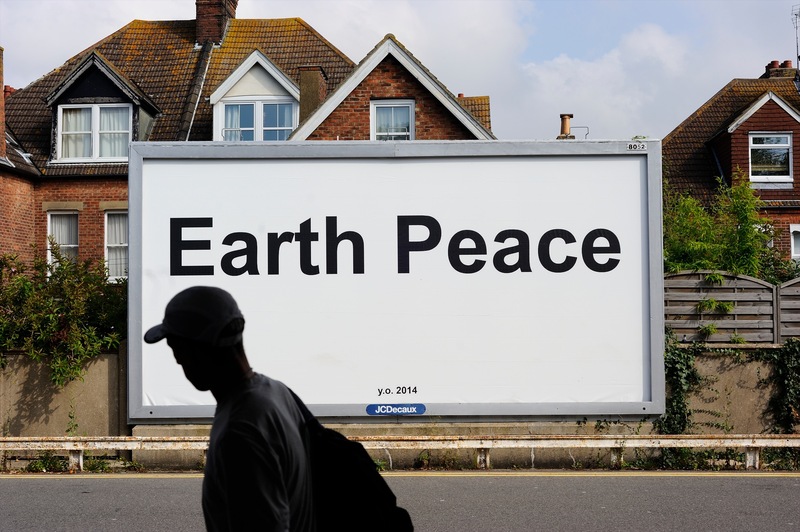 Working with Southeastern Trains for an extensive poster campaign throughout Kent to promote Folkestone & the Triennial. Working with Southeastern Trains to secure free train tickets for 50 national and international press journalists for the press day of the Triennial on Thursday 28 August. Printing and distributing Folkestone Triennial branded Do Not Disturb cards to be used in all Folkestone Hotels. 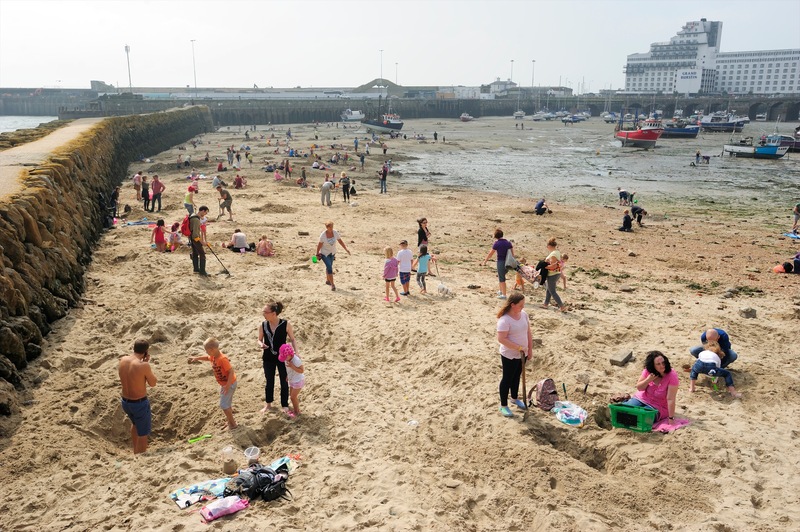 In collaboration with the Turner Contemporary, Folkestone Triennial commissioned an installation by Krijn de Koning which was also replicated in Margate and cross-promoted this work through press material and e-flyers. Monitoring audience attendance and demographics and undertake extensive market research. Working with P&O Ferries and DFDS to distribute Triennial maps on all ferries and encourage international visitors to stop at Folkestone. Extensive coverage of Folkestone Triennial and the town in the Visit Kent website, dedicated e-newsletters in English, French, Dutch and German, and across all social media platforms. Extensive coverage of Folkestone Triennial and the town in Southeastern website and dedicated e-newsletters. Extensive coverage of Folkestone Triennial and the town in Eurotunnel website, blogs and newsletter. Extensive coverage of Folkestone Triennial and the town through Visit Britain, Visit England and the French Tourism Boards. Developed relationships between the CF and local hotels. Developed relationships between the CF and other tourist attractions in Kent. This was the first time that the Creative Foundation sought to develop strategic partnerships with all these organisations, travel operators, hotels and other culture and tourist attractions. Culture Kent enabled us to do so and we are now in the process of deepening these relationships and entering into conversations for future joined working on projects about Folkestone Artworks and the Creative Quarter. The Culture Kent funding came about only months before the opening of the Triennial. As a consequence we didn’t have the time to pursue further partnership projects with organisations such as Eurotunnel, P&O and Southeastern that would have added extra value to the project and would have enabled us to reach even more people. We commissioned Visit Kent to broker these relationships for us but due to limited time some of them didn’t come to fruition. Our relationship with the local hotels especially benefited and now we have an ongoing dialogue about how art and the hospitality sector can boost tourism in Shepway. After the end of the Triennial we donated the bamboo from Gabriel Lester’s installation The Electrified Line to Port Lympne Safari Park. They are using it to build a new structure for their wild cats. This partly came about after the Triennial Kiosk visited Port Lympne during the show and the two organisations started talking about partnership working and cross promotion. In April and May 2015 the Creative Foundation was invited to have a pop up shop at Bluewater Shopping Centre for six weeks showcasing the work of 26 artists and makers from the Folkestone Creative Quarter, attracting more than 6,000 people through the shop’s doors and promoting the town and its creative force. The Bluewater staff told us that we came under their radar due to the work we did for the Triennial and Culture Kent when they came across the kiosk during its tour. Did you attend the Folkstone Triennial? Please leave a comment on your experience or thoughts!